The K6 is without doubt a true classic. Made of wood and fabric in the Poppenhaus glider caves of Germany, the K6 has been the trusty steed of early solo pilots for many years. It is not the most modern glider in the world and after 4 hours your bum will be losing most sensation, but at least that takes your mind off the spring trimmer. 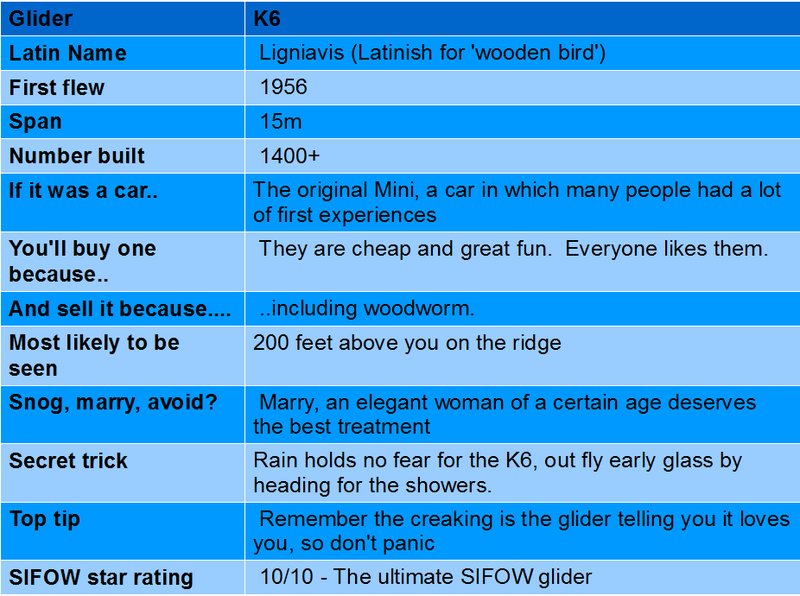 Recently K6-cr gliders have been selling for less than £3,000 and (listen up hang-glider pilots) for something that gives you nearly 30-1 glide angle and the ability to climb on a sparrow's fart, that is an absolute bargain. The higher performance K6-e is still regularly flown in handicapped competitions with great success. K6's capture the true spirit of SIFOW and if you have never flown in one, beg, steal or borrow a ride soon.